The SOTA Silverhawks improved to 10-4 with their sixth straight win. Tyquil Glasgow finished with 15 points on the night as the Monroe Redjackets improved to 9-4 on the season with a 73-64 win over Livonia in non-league action. The senior, who is fourth in the RCAC Lower Division averaging 20.6 points per game, has scored in double figures in all 13 of those games. READ MORE. Saheed Miller’s layup with :11 seconds remaining in overtime proved to be the game winner as SOTA rallied for its sixth straight win. Ethain Clarke-DeSouza hit a 3-pointer from the left baseline as time expired in regulation to send the game into overtime. The sophomore scored a season-high 31 points to go with 10 rebounds to lead the Silverhawks. Ke’Vion Mitchell followed with 22 points, while dishing out six assists. Lamar Lovelace paced NE Douglass (No. 23 NYSSWA Class A) with a career-high 42 points. The junior guard went 13-for-15 at the line and connected on three three-pointers. NE Douglass jumped out to a 39-26 lead in the first half, in part to six buckets from the behind the arc. Other scorers: SOTA – Logan Hayes (17), Reggie Smith (7), Miller (3), Jonathm Denegal (3). NE Douglass – Adonis Flagler (16), Jiahmere Mitchell (9), Trevion Miller (7), Maurice Glenn (5), Casey Diometre (3). In the back-and-forth game, Franklin’s third quarter proved to be the difference. Trailing by two at halftime, Brandon Moore and Marcher Spencer each sank two treys as Franklin outscored Edison Tech 24-18 to take a 54-50 advantage after three quarters. Anthony Smith sealed the win six late free throws. Moore finished with a game-high 22 points to go with seven rebounds; Spencer followed with 20. Thanks to nine fourth-quarter points, Smith added 13 points, going 8-for-12 at the stripe. Javonte McKnight led Edison Tech with 16 points. Jawaun Holt finished with 15. Other scorers: Franklin – Devonte Goins (9), Tyrone House (8), Kentonio Kelly (4), Teriq Johnson (2). Edison Tech – Alton Knight (14), Natrell Colbert (8), Torrean Lewis (7), Tahaj Washington (4), Jordan Leslie (3), Edgar Bass IV (2), Jeremiah Montalvo (1). Rondell Watson connected three times behind the 3-point and poured in 15 of his game-high 26 points in the second quarter when Leadership outscored R-H, 22-11 to take a 39-29 lead into halftime. Kennyh Hardeman finished with 15 points, 16 rebounds and four blocks for the Lions. Maurice McKinney added 11 points. Calvin Washington (7), Shamir McCullough (6) and Nate Doyle, Jr. (5) rounded out the scoring for Leadership. Shamire Broyld paced R-H with 18 points. Javonte Williams added 15, and Timmy Jackson had 11. Eddie beverly (9), Charles Bowden (7) and Nyles Goodwin (4) rounded out the scoring for the Royal Comets. Kobe Long and Jermaine Taggart combined for 17 points in the first quarter, as McQuaid (No. 15 Class AA) jumped out to a 23-9 lead over Wilson. Behind the duo, McQuaid continued to add on. Long, who averages 22.64 points per game, finished with 25 points, including three treys. Taggart followed with 19 on eight field goals. The Knights maintained a steady lead, even with Wilson narrowly outscoring them in the second half. Wilson totaled 35 second half points, 17 in the third and 18 in the fourth. Of their 18 points in the fourth, Arthur Wilson dropped in 12 of them. The junior finished 14, as did his teammate Robert Davis. Davis knocked down three from behind the arc on his way to the team-high 14 points. Kris Perez scored 15 of his season-high 27 points in the first quarter when Greece Olympia jumped to a 32-5 lead. The Spartans led wire-to-wire opening the game on a 12-0 run. Jeff Jung, Jr. added 22 points. The Spartans grabbed a total of 46 rebounds in the win, 12 of those boards coming from Collin James who also dropped 16 points, had six assists and five blocks. The Spartans offense was topped of by Darnell Williams who contributed nine points and eight rebounds. Zahir Green added a season-high 12 points off the bench. Wesley Elmore grabbed six rebounds and scored two points. Latrell Smith (3) and Torian Sheppard (2) rounded out the scoring. Perez added five steals. Evan Caufield and Anthony Stephenson led the Titans with 11 points apiece. Elijah Barnard (9), Kyle Blum (9), Adam Hurlbutt (8), Sean Crowell (6), Casey Amato (2) and Evan Insley (1) rounded out the Arcadia scoring. Mason McFollins and Caeden White combined for 13 third-quarter points when Batavia turned a one-point deficit at halftime into a nine-point advantage going into the fourth quarter. Trailing 28-27, McFollins scored seven of his 16 points in the third, and White added six as the Blue Devils outpaced Brighton 22-12 in the quarter. White scored 12 in the game. Andrew Francis finished with a game-high 22 points including 11 in the final quarter. Francis connected four times behind the 3-point arc to pace a long-range attack which saw the Blue Devils hit nine 3-pointers. Matt Sponsel led Brighton with 17 points, 11 of which he scored in the first half. Matt Falter added 11 points of his 13 points in the first half. Jack Falter connected three times behind the 3-point arc and finished with 13. Other scorers: Batavia – Camden White (7), Joe Martinucci (4), Luke Grammatico (3), Zach Gilebarto (2), Trevor Zewan (1). Brighton – Chase Seibold (4), Casey McDermott (4). Trailing by as many as five points in the fourth quarter, Gates-Chili closed the game on an 11-0 run in the final four minutes. READ MORE. Melvin Council, Jr. scored 26 points, and Kelvin Reaves, Jr. added 21 as Athena (No. 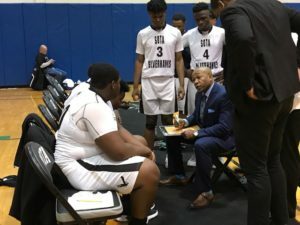 22 NYSSWA Class A) won its fourth straight game. The duo scored all 12 of Athena’s points in the fourth quarter. Council converted on 6-of-6 attempts from the free throw line for the game. Reaves connected four times behind the 3-point arc. DeAndre Newsome scored eight points. Austin Brown had five points and Johnny Salone, four to round out the scoring for Athena. Josh Stenglein led four Irondequoit Eagles (No. 16 NYSSWA Class A) in double figures with 17 points. Freddie June, Jr. added 13 while Keenan Robertson and Luke Melidona scored 10 apiece. Connor Shafer (3), Patrick Thomas (3), Kenny Gonzalez (4) and Jack Brennan (1) rounded out the scoring for Irondequoit. The game was a rematch of the past two Section V Class A1 finals. In a state-ranked matchup, Pittsford Mendon (No. 14 NYSSWA Class A) pulled away in the second half with the help of its top three scorers. Daniel Cook scored nine to pace a 23-9 third quarter. Cook finished with 29 points and 21 rebounds for his eighth double-double of the season. The senior scored 40 points last time out against Brockport. Michael Harrington and Jacob Shadders added 16 points apiece. Shadders also handed out 10 assists. For Odyssey (No. 14 NYSSWA Class B), Jaden Hartsfield scored a team-high 14 points with 10 points in the final quarter. Travon Harper followed with 13. Other scorers: Mendon – Connor Krapf (6), Charlie Bennett (3), Nate Strauf (2). Odyssey – Ray Colbert (5), Dylan Kolmetz (5), Aric Williams (4), Presten Mathis (4), Josh Haff (4), Korey Canton (3), Romell Griffin (2). Kevin Ryan scored 20 while Ben DiGiovanni and Matt Panera added 17 and 12 points respectively for Sutherland which won for the third time in four games. HF-L battled back and cut a 16-point deficit to 56-50 with 1:40 left on a Josh Vogt jump shot, but that was as close as they would get. Trevor Chamberlain led HF-L with 23 points. Patrick Lustyk added nine points and nine rebounds. Hayden Smith and Vogt had seven points apiece. Derek Childs (2) and Mitch Slymon (2) rounded out the scoring for the Cougars. John Luther (3), John Messina (3), Patrick Sanna (3), Connor Fitzsimmons (2) and Owen Flisnik (2) rounded out the scoring for Sutherland. The Knights shot 19-of-24 at the free throw line on the night. Terrence Reid and Jamel Demery combined for 17 points in the third quarter when Eastridge outscored Brockport 24-9. Reid matched his season-high with 21 points and etched his third consecutive double-digit performance. Demery connected 10 times from the floor, five in the first and five in the second for a season-high 20 points. Kyle Palka led Brockport with 13 points. Troy Leibert and Shamar Lee followed with 10 apiece. Other scorers: Eastridge – Jalen Rose-Hannah (8), Jaden Keech (7), Koby Jones (3). Brockport – Ishmael Hannah (8), Esten Schalge (7), Kevin Lawrenz (6), Willie Ball (2), Sam Velletri (1). Fairport connected three times behind the 3-point arc and five different players contributed as the Red Raiders erased a five-point halftime deficit with a 19-6 third quarter. Ryan Lucey scored five of his 16 points in the decisive quarter. Max Molisani added five of his 11 for the game. Vanzell Johnson made the lead stick in the fourth quarter when the senior guard converted on 12-of-14 free throw attempts. Johnson finished with a game-high 24 points. Stefan Milinkovic scored eight points for Fairport. Brett Heininger added five. Andre Starks had three points. Marcus Postell paced four Saints in double figures with 15 points. Griffen Stella added 13 while Marcellus James and John Keele added 10 apiece. Terrence Wilson had seven points for C-C. Kamerin Poromon chipped in with four points. John Bagley had three. Collin Donnelly connected on the game-winning layup with 1.3 seconds remaining to cap a fourth-quarter Schroeder comeback. Trailing by four at 39-35 after three quarters of play, Luke Insley and JoJo Plummer combined for 12 points as the Warriors outscored their crosstown rivals 16-10 in the final stanza. Plummer finished with a team-high 21 points on the night. Ansley added 16. Donnelly scored nine. Josh Hauman added five points for Schroeder. Andrew Mason matched Plummer and paced Webster Thomas with 21 points. Dannie Palmer added 16. Garrett Reeves scored five for the Titans. Nick Linder (3), Tyler Williams (2) and Evan Mitchell (2) rounded out the scoring for Thomas. Patrick Piampiano connected on six 3-pointers and finished with a game and season-high 31 points to lead Penfield. The senior guard had 12 points in the second quarter when Penfield outscored Kearney 25-12. Javion Monroe added 13 points for the Patriots which have won three of their last five games. Dan Vercruysse and RJ Green added seven apiece. Jayden Bulger scored four. Ryan Novy (2), RJ Wilkins (2) and Ryan Wensley (1) rounded out the scoring for Penfield. The Patriots two recent losses came by a combined six points. Michael Gentile scored 13 to lead Kearney. Kidtrell Blocker had 11 points. Antwan Williams scored 10 while Miles Monchecourt added nine points. Jamal Williams (8), Deiontray Dixon (6) and Miles Rose (2) also scored for BK. In a state-ranked showdown, Alexander (No. 20 Class C) could not overcome Elba’s (No. 4 NYSSWA Class D) top scoring duo. Colton Dillon (26 points/12 rebounds) and Jon Boyce (21 points/15 rebounds) posted double-doubles to lead Elba to its seventh straight victory. Dillon connected nine times from the floor including three from behind the 3-point arc in his game-high performance. Four Alexander players impacted the board. Tyrone Woods and Chris McClivic notched 14 points apiece. McClivic scored eight of his points in the final quarter, six of those from the free throw line. Ryan Davis and Dylan Busch scored 13 and four points respectively. Other Elba scorers: Evan Hare (5), Collin O’Halloran (5), Greyson Huntingdon (4).